People ask me what I do on a a regular basis. For this and various other reasons I'll shed some light on the current situation. 1.Medisolv is a company I've worked with in various roles for the last 10+ years. I'm now CTO, but still work with various product teams and commit production code as often as possible, which is by far finest part of the job. We will be hiring more software developers in the near future, so keep an eye out if you are interested. 2. Pluralsight is where I make glorious training videos. I'm currently working on a couple different courses and plan to finish "Learning To Program" in the next couple weeks. Making videos for Pluralsight is fun. 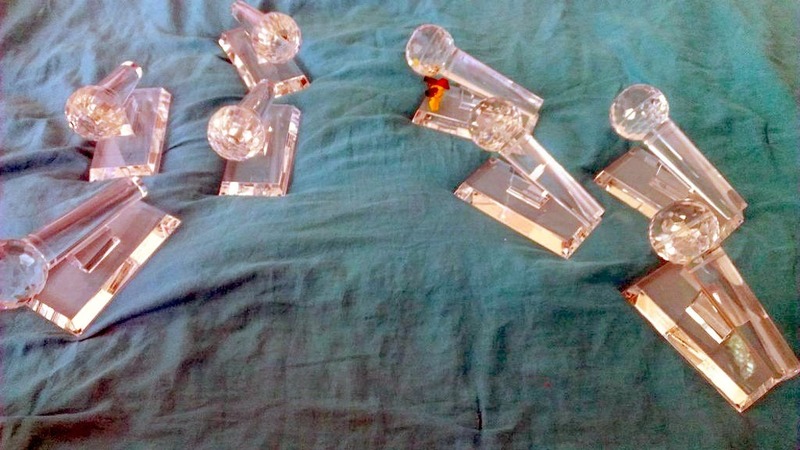 Over the years I've collected 8 crystal microphones from Pluralsight as an award for making a Top 10 course. Occasionally I arrange them on the floor to recreate great naval battles from the 18th century. The photo to the right is the Battle of Valcour Island. You can see General Carleton advancing British warships towards the American's Congress and Royal Savage. 3. OdeToCode LLC is the company I own and operate for consulting services, but I've scaled back operations to simplify life and I am currently not taking on new work. 4. Workshops, Classes, and Conferences allow me to occasionally get out and see the world. I enjoy the classes I teach for DeveloperFocus and ProgramUtvikling and plan to update and revise my current curriculum to include topics like AngularJS and web service design with WebAPI. Conferences are fun, but also stressful and time consuming, so I'm cutting back. I will be at DevSum, NDC, and the fall DevIntersection this year. @David - ah, yes. That, too. "Medisolv is looking for a *young* talented and motivated Software Developer to work as a member of our growing software team!" Huh, I didn't realize age discrimination was legal in Maryland. @Kyralessa - I'll get that changed. Apologies.